Quick growing screen or specimen. Attractive reddish brown, scaly bark. 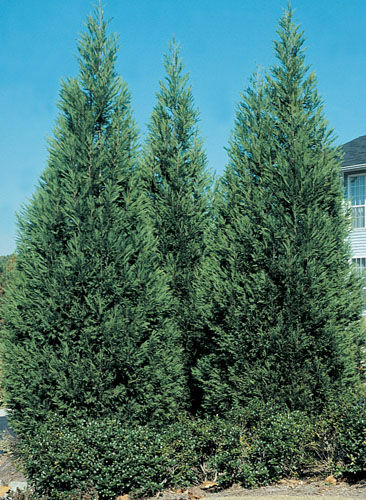 When planting a leyland cypress as a single specimen give it plenty of room to grow. As it matures it can spread 15 to 20 feet in diameter and can grow in heights of 60 to 70 feet tall. When used as a windbreak or privacy screen plant 6 to 8 feet apart in a row; the tree will maintain about a 6 to 8 foot diameter with an estimated height of 20 to 30 feet tall. Fertilize in spring with an all purpose fertilizer for acid loving plants before new growth begins. The recommended spacing for a windbreak or a privacy screen is 6 to 8 feet apart. Click on the "About Us" tab to find planting instructions.